Continuous technological innovations and economic trends have resulted in the demand for fourth generation shopping center directories. 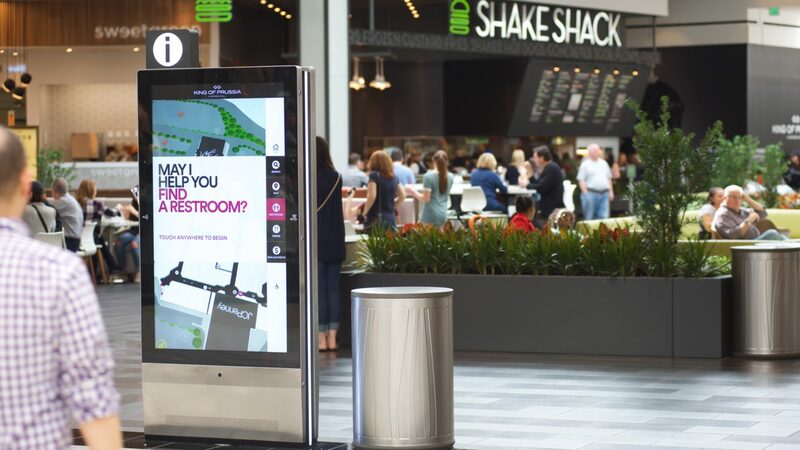 These highly interactive displays can combine durable wireless design, connections to mobile technology, and the capacity to change content based on environmental observation. Simon Property Group, a global commercial real estate company with more than 325 properties across North America and Asia, chose Gable to create the physical, software and management systems needed to create world-class fourth generation directories for its properties. 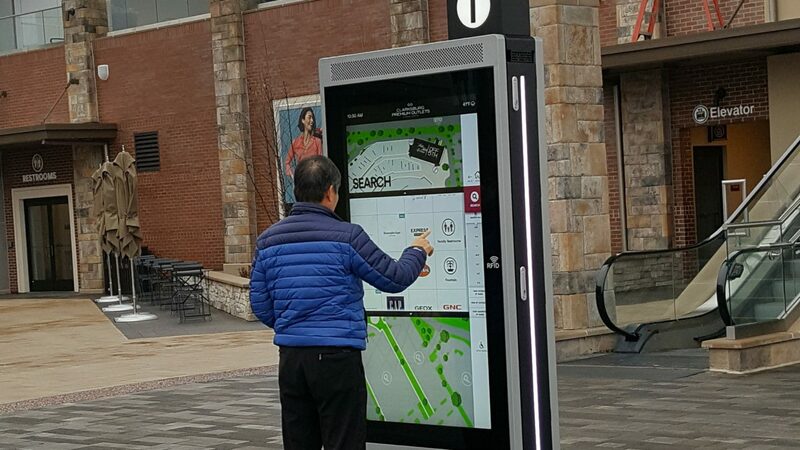 In Fall 2015, Gable began working with Simon Property Group to create a prototype of innovative, new digital directories designed to meet the needs of millions of visitors at Simon Malls. Simon has had directories in its malls for over 30 years, and has worked with other vendors to develop interactive directory systems. However, these efforts fell short in meeting all of Simon’s stringent needs for directories with a durable design, and a robust content system that could take advantage of their large in-house product advertising team. After working with Gable on a series of display projects at properties throughout the United States and recognizing Gable’s ability to deliver end-to-end solutions for its clients, Simon decided to work more closely with Gable to create a directory system uniquely adapted to its specific needs. A collaborative development team was formed, led by Stephen Gottlich, Vice President of Digital and Strategic Alliances for Gable. Gable also brought in a number of companies to support their innovation efforts including Acquire Digital, the software company behind the robust and flexible 3-dimensional mapping software system. In addition, Gable worked closely to integrate Simon’s in-house systems with Mappedin, Simon’s internal software for managing retail spaces. A sophisticated 3-dimensional navigation system with advanced search options and connectivity with mobile devices. Utilizing an open and transparent process, Gable closely collaborated with Simon to develop the most advanced shopping center directory in the world. Over six months, Gable and Simon worked on research and development, digging into different hardware and software technologies available globally. Gable conducted an analysis of each technology, ranking attributes based on a variety of factors including price, durability, ease of use, and ability to meet program requirements. Toward the end of Summer 2016, Simon and Gable arrived on a directory designed to include the most advanced hardware and software technologies available. 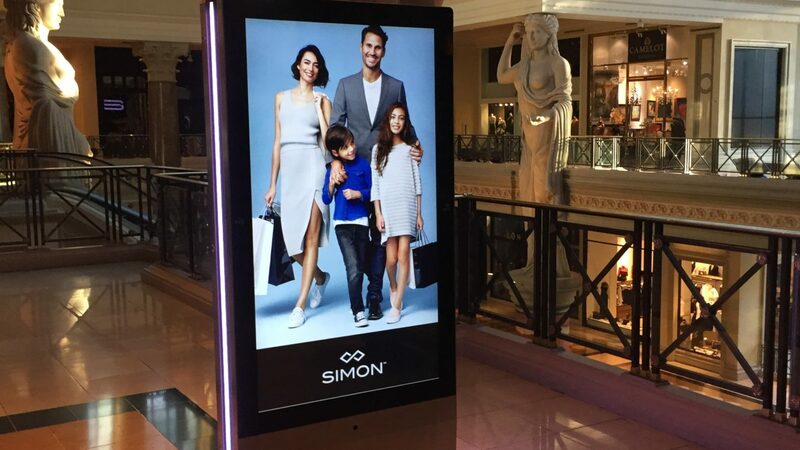 Simon’s new, fourth generation digital directories incorporate the latest in digital wayfinding and interactive capabilities, and are designed to provide shoppers with convenient access to what’s going on at their favorite mall through an engaging new user interface. The directories offer a sleek and durable design, housed in a double-sided, thin informational landmark offering an easily lockable case. Color changing strips enhance themes such as pink for breast cancer awareness month. The directories feature a 65-inch LCD display with, full HD projective capacity touchscreens that have adjustable illumination to work in different lighting conditions. The directories are connected to powerful wireless networked computers that can switch between WiFi and 4G signals, erasing any potential downtime due to service outages. The directories include next-generation operating system with 3-dimensional mapping and drop-down search options, connected to an internal information management systems. 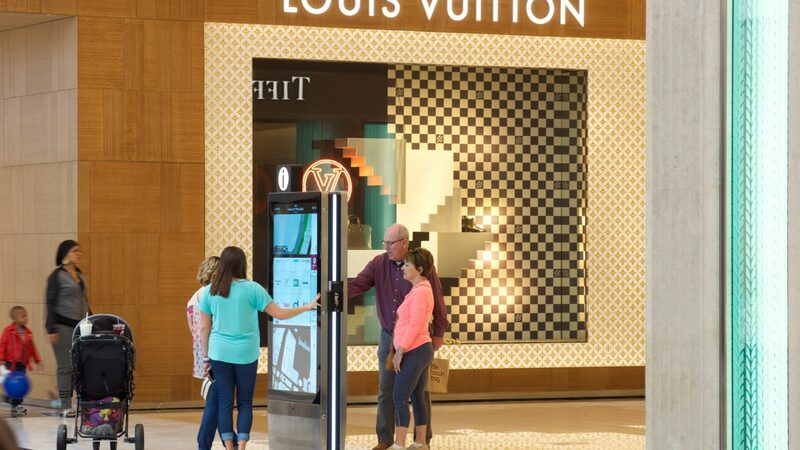 The directories are easy for each individual mall to install, allowing Simon to roll out the products quickly on a national scale. For shoppers, the directories are easy to use and offer a unique experience inside each mall. The directories first come to life when a shopper walks within a few feet of the screen. The digital, interactive maps highlight the location of shops and services, then display the fastest route for shoppers to take. Shoppers also have the option to send those directions to their mobile device through a variety of digital communication channels (beacons, NFC, SMS, etc.). A universal search option allows for a quick search of stores, dining options and services. Information on the latest offers and deals available from retailers and restaurants equips shoppers with all the information they need to make their shopping trip productive and enjoyable. In addition, the digital directories use the latest location-based marketing technology to allow brands to connect directly with their customers with real-time, relevant information. Testing of the prototype directory proved to be a resounding success. Directories were effective under the most strenuous weather conditions and met all of Simon’s high standards for creating an effective visitor experience. In Fall 2016, directories were unveiled as part of King of Prussia’s grand reopening festivities in August and were also installed at Clarksburg Premium Outlets (Clarksburg, MD); Copley Place (Boston, MA); Fashion Centre at Pentagon City (Arlington, VA); Florida Mall (Orlando, FL); Forum Shops at Caesars Palace (Las Vegas, NV); The Galleria (Houston, TX); The Westchester (White Plains, NY); Stanford Shopping Center (Palo Alto, CA) and Del Amo Fashion Center (Torrance, CA). Installations to expand are continuing on a rolling basis. Simon is extremely pleased with the impact of the new directories, especially the ability for users to view them as extensions of their mobile devices, making them more approachable. In addition, the wireless directory system has been delivering on its promise to expand Simon’s revenue stream from advertising, making the platform a more exciting sell to retailer and product companies buying advertising space. “The directories are really simple to market to the advertisers who support the system. It’s a beautiful design. It is striking from a distance. It catches your attention. The content management system is, as far as the advertiser is concerned, is turnkey. They provide us the artwork, and we take care of everything from there.” – Chip Harding, SVP, Business Development, Simon Property Group. About Simon Property Group: Simon is a global leader in retail real estate ownership, management and development, and an S&P100 company (Simon Property Group, NYSE:SPG.) Our industry-leading retail properties and investments across North America, Europe and Asia, including Aventura Mall, Roosevelt Field and Woodbury Common Premium Outlets, provide shopping experiences for millions of consumers every day and generate billions in annual retail sales. We are headquartered in Indianapolis, Indiana and employ approximately 5,500 people in the U.S. Read more About Simon. About Gable: As an award-winning provider of digital displays, audiovisual and media; signs and architectural elements; and lighting solutions, Gable helps its clients attract, connect and engage people through effective visual communications. Based in Baltimore, MD, Gable is expanding the possibilities of how businesses communicate in the built world through its comprehensive capabilities, culture of creativity, knowledge of technology and forward-thinking visual solutions.